GuestHaus Residency (GHR) was established in 2011 by curator and writer Chloë Flores and builder Tim Lefevre to offer free housing to artists and scholars who are visiting Los Angeles in conjunction with a project, education, or research and with the support of a local institution, non-profit organization, and/or artist-run space. GuestHaus Residency was conceived as an alternative economic model that opens a private space to public possibilities in a city, which continues to expand, with little public space. The residency is located in Mount Washington, near Downtown Los Angeles and nestled in a lush setting with stunning southeastern views of the Los Angeles basin. 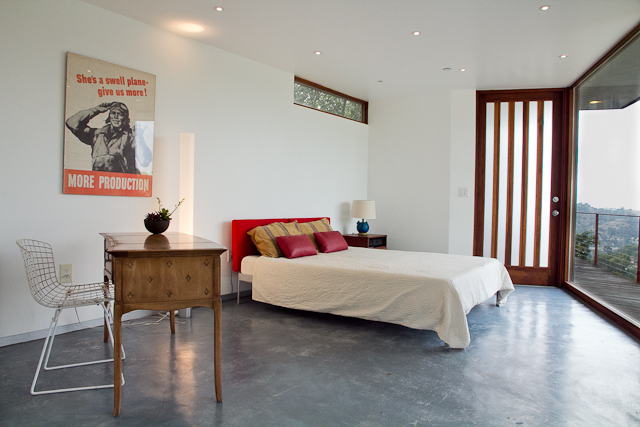 The guesthouse was designed by Fung + Blatt Architects in a classic Los Angeles modern style. It has an indoor/outdoor sensibility with large windows, a sliding glass side door, and a private deck with a café table and chairs where one can take in the surroundings. The interior is furnished with a queen bed; writing desk and chair; nightstand and reading lamp; and equipped with a bathroom/shower; Wi-Fi Internet access; and an espresso machine. Residents are welcome to entertain visitors and have access to the kitchen in the main house. GuestHaus Residency provides housing only and intends to be a place where the resident can find repose away from work, to both rest and contemplate. The GHR is available seasonally, between January and November, for stays up to 3 weeks (depending on the demands of each project). Consideration goes to a wide breadth of cultural producers with diverse practices and institutions that have varied functions.